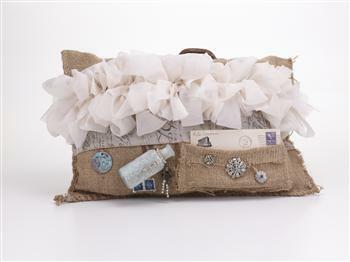 The extra small pillow is decorated with a jeweled key, as well as our signature handle. Keys will vary depending on availability. The three pillow picture shows a variety of keys. 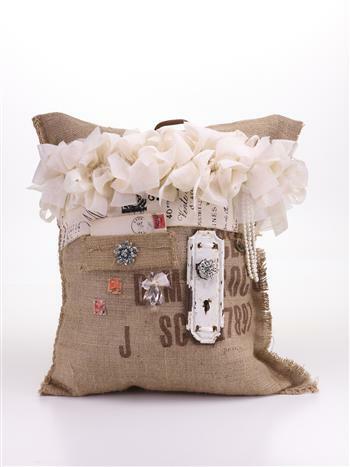 The small, medium and large pillows are decorated with vintage memorabilia such as letters/envelopes from 1895-1960, vintage hardware, booklets and jewelry, making each one totally unique. 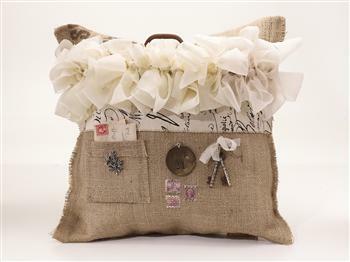 The focal point other than the memorabilia are the bows and under trim with each pillow topped with our signature handle. The bows on all pillow sizes come in cream crushed voile. Specify when ordering. Sizes are approximate as they are handmade.